1510 Duco Cast Iron Body Scupper Drains - Jay R. Smith MFG Co.
Used at junction of roof and parapet. Side outlet (90°) drains may be connected to outside downspout by using drain in conjunction with Fig. 1550 downspout adaptor. When connecting to an inside leader, the 45° outlet drains may be easily offset into the wall. The flush grate prevents obstruction to traffic. 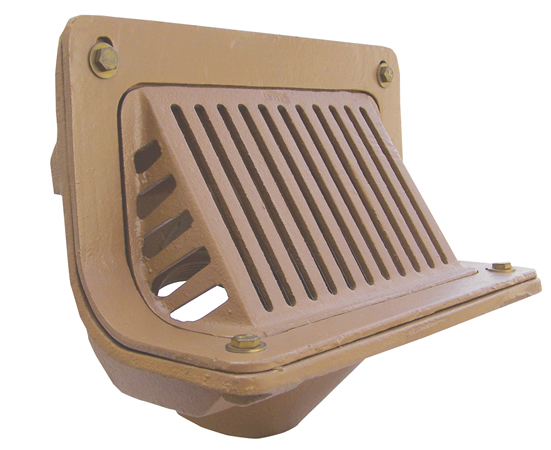 The angle grate prevents debris from blocking drainage. Duco Cast Iron Body, Flashing Clamp and Loose Set Grate. Type of Outlet and Grate as indicated by Figure Number Selected. Smith No. 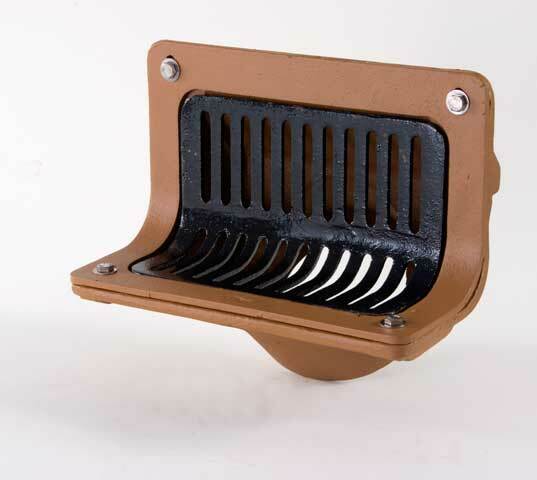 1510 cast iron body, flashing clamp and loose set angle grate. Smith No. 1785, 1786 or 1787 series cast iron downspout boots on exposed sheet metal leaders.